Chiaki had asked Takao to brunch today, and she bolted upright in bed, shaking her dreams away in a hurry and looking at the clock. Apparently, there was this little cute place, in the middle of the village called the Yakiniku Q. Her mother had talked about it and it was where her father had taken her on a first date, when he got the hint that was. She rubbed furiously at the corners of her eyes, the feeling of sleepy grit was not pleasant, but at least she was getting rid of it before she was overtaken by a sudden urge to stretch. She lifted her arms high above her head, feeling her nighty pull at her back and groaned with her mouth closed in a refreshing, “Mmmm” to greet the day. The clock had said that she woke up at 7, plenty of time before their brunch date at eleven. She nodded to herself and scratched the back of her head before yawning. She hadn’t picked out an outfit yet, and wanted to look good for the Hokage. He had made an impression on her, and as much as she hated it, he actually looked quite handsome when she had the chance to actually look at him last mission that he did. Looking around, Chiaki found herself in a mess of unfolded clothes and hanging linens. She had been too lazy to pick up her laundry last night, and she regretted it as soon as she looked around. What a mess. Scurrying out from under the covers, she bent low and picked up the clothing, tugging her nighty down to remain decent for… well if she had anyone over, that’s who it would be for. She sighed deeply and looked around, a lonely place. But she had a friend now. Nodding to reassure herself she tidied up, stuffing her laundry into the hamper and clambering out of her nighty she hung it back up and took a look at herself in the mirror. The recent activity, mission in the hospital, and mission with Takao had given her reason to look. Well, she didn’t see anything wrong with the way that she looked now, she had built some muscle, but her chest had reduced somewhat. Perhaps she should eat some more sugary foods to keep them up to par? Otherwise, she would have to buy all new underwear. Grumbling to herself she pressed against them to see if she could wear anything that might show a little bit of cleavage, and came up short. Then again, everything in her life came up short, and it seemed like no man would ever take her seriously as long as she was the height she was. She had a job at the hospital now, thanks to the last mission, and a steady source of income from Doctor Hui and from her missions. She had a lot to offer, or at least that’s what she told herself before deflating with a sigh. No. There wasn’t much to offer from a shorty with no real body or talent to speak of, living in a one bedroom apartment with no stable income. She didn’t have a regular job after all, and she would constantly be in danger. Humming a tune idly, she stepped into the shower and shaved everywhere, just in case he wanted to go for a swim or to the onsen. Carefully shaving every bit of hair off of her lower body, she made sure to get her underarms as well and nodded to herself, giving a once over with a twist of her back from side to side, looking over each shoulder and then down. Better, she supposed. Scrubbing her hair and body came next and then as she stepped out to dry, her phone rang. Of bleeding course it would at this time. Grumbling and wrapping her towel around herself she scrambled to the phone to pick it up. “H-hello?” She asked, not able to see the caller ID before she picked up. “I’m alright, I am going to go get brunch with a friend.” She nodded, though the gesture couldn’t be seen through the phone. “Anyone I know?” She heard his plaintive voice as he made small talk, and tried to weasel his way into her personal affairs, like he always did. “I’ll just remind you to always be safe.” Her father’s voice came over the phone again, a lovingly wary tone adopted now. She exchanged pleasantries and hung up the phone. Next was drying her hair and finding something to wear. She looked through her clothing, trying to pick out something casual but also a bit dressy. She didn’t want to wear what she always wore, that was bland and tasteless, and she didn’t want to go too formal. Frazzled she sifted through the closet with a shake of her head to some, and a tilt of her head to others, considering them before ultimately moving on. Finally, she came to a bright yellow sun dress that she hadn’t worn in years. She smiled and tossed it over her head, letting the fabric nestle against her. It was flowy, didn’t require much upkeep, and quite cute. She also didn’t have to prepare much for it. Slipping some underwear underneath the bright sundress she looked at herself in the mirror and tamed her wild hairdo, deciding to go for a singular long braid, rather than her twin tails that she was so fond of. Wrapping this braid into a bun she smiled at her reflection in the mirror. Perfect. She looked at the clock. Even though they had said eleven and she made reservations, she didn’t know what to do with herself until then. It was only ten o’ clock. Chiaki sighed and looked around the house, there was nothing more to tidy, nothing more to get into unless she wanted to be late. Well, she could leasurely stroll there. She decided that was what she would do. Grabbing a small dulled yellow clutch she crammed her keys and other essentials into the small thing along with some Ryo for her meal and locked the door behind her. Chiaki passed by some stores on the way, and decided to buy a ribbon for her hair from a woman who was selling them to children. It was a bright blue and caught the morning’s sun with glitter worked into the stitching. She tied it in a small bow and let it stream from her braided bun on her head as she walked towards the grill. She arrived ten minutes early, after dawdling and window shopping, holding her clutch with both hands in front of her and looking expectantly into the crowd, waiting for Takao. A long, drawn out yawn escaped from Takao's throat as heavy footsteps carried him onward. Duties had been piling up, responsibilities were becoming overbearing, and the stress he endured was palpable. Yet no complaint ever left his lips, for it was his choice to take on the facets that brought him such strain, after all. Nearly nine in the morning and already exhausted, the raven-haired Jōnin dragged his feet with each step. Early morning missions had been done, his class at the Academy taught, and his pets taken care of. Fuyuko was out on a mission as well, which left his schedule mind-numbingly clear of activity for about an hour or so. He did have plans besides work which was a welcome change, yet plenty of time to kill before then lead him through the streets of the Hidden Leaf, finally arriving back at his home. Greeted by his ever-excited dog after pushing the front door open, Takao slunk across hardwood floors with heavy steps and sank into a nearby couch. The grey-furred canine sat beside his legs, and he was soon joined by the all-black cat that skulked about the home, sitting nearby on the back of the couch. Oh, how he had come to miss his time in the Hidden Mist. "Can't believe I miss that place." He said, lopsided smile curling upward in disbelief as his head tilted up and against the back of the couch. The dog's head rested on Takao's knee, whose hand idly rubbed behind the canine's ears. "...Well, not the place so much, I guess." Sucking in a breath and exhaling it as an exaggerated sigh, Takao shook his head. "Whatever. C'mon bud, I'm gonna get ready for this lunch thing." He said and, with great effort, pushed to a stand within a few minutes of reclining into the couch. If he didn't force his body to move now, he'd never get himself up and about. Having reluctantly left the comfort of the couch, Takao made his way upstairs. A quick shower shed the accumulated grime of a mere few hours of work and afforded some semblance of relaxation; he reveled in the scalding water hot enough to burn normal skin. But, his skin was not normal, the blood of the Dragon King ran through his veins, and the burning water merely felt as if it were a comfortable warmth. He stepped out, lazily draped a towel over his shoulder, and walked into the adjacent bedroom. The only person that would walk in unannounced had already seen him in the nip before, so he hardly felt the need to cover up. With as little effort as he could muster, he dried himself off while sorting through the clothing he would wear, quickly deciding on an ensemble as casual as casual could get. 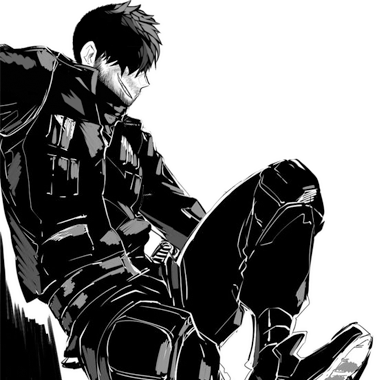 Once fully dried, he dressed himself quickly, donning a grey undershirt, black hoodie with matching black shinobi-styled slacks tucked into, of course, the shined boots that he always wore. He, under the assumption that their planned lunch was a relatively casual affair, had opted to dress accordingly. Making his way back downstairs a mere ten minutes or so after having arrived home, he swiped his wallet and keys from the door-side table. As he did so, his eyes were drawn the excited canine countenance wiggling uncontrollably beside him. Scarred eyebrow cocked skyward, Takao's gaze rested on the wiggling dog. "What?" He asked, as if expecting an answer from the dog. "I just had you out. Go lay down." Takao said, waving off to the side as he tucked his wallet and keys into his pockets, leaning down to write a quick note just in case Fuyuko returned before he did, letting her know where he would be. As he did, he watched the dog remain in place and continue its overexcited behaviour, perhaps thinking that they would be going out on another walk. As Takao descended to the genkan and pulled his boots on, the dog hovered nearby, watching the raven-haired shinobi lace up the footwear. He began to bounce on his front legs, growing increasingly excited at the prospect of a second walk without knowing that Takao hadn't the intention to do so. But, as Takao stood and rest his hand on the doorknob, his gaze fell upon the dog again, and their eyes met. The expectant gaze brought him to pause and he sighed. "Alright, fine. Go get your lead." He said, tone defeated. Treading along happily with Takao at his side, the pair made their way through the bustling streets of the Hidden Leaf. Even in winter, the day-life of the village was as busy as ever. They had agreed to meet at Yakiniku Q, a popular grill that had been around since before the 'Age of Heroes' some time ago. It was as much of a stable of the Leaf as Ichiraku was in terms of culinary legacy. Standing outside of the restaurant, he could see a familiar short girl in a yellow sun dress and bright blue bow, making her stand out amidst the passing crowd. "Hey, Chiaki," Takao greeted, his hand hand risen from its perch in his pocket. "I hope you don't mind me uh, bringing some... company." He said, lowering his hand as the grey-furred dog sat at his side, tail wagging and mouth agape, tongue hanging out to the side as he panted excitedly. "He wouldn't leave me alone on the way out." An apologetic smile grew on his face as he spoke. Dogs seemed to be quite popular, especially in a shinobi village where ninken were abundant, so he had hoped the third wheel wouldn't be too much of a bother. "I hope I didn't make you wait too long." She looked down at the dog, who was busying himself with his master, or friend, however dog person relationships worked, and nodded, “I don’t mind. We’ll probably have to sit outside though. I ah.” She reddened a bit and looked down at herself and then got a good look at him in his outfit, “I hope I am not overdressed. I got a bit nervous.” She gulped and let the dog do what it would with her proffered hand, as she shook her head to his comment. “You didn’t make me wait long, I just get to everywhere early. I ah, I get that from my mother. I am just glad that I have the common sense not to do what she did to my dad.” She gave a little grin, “But that’s a story for another time, shall we?” She gestured into the restaurant with one hand and raised her eyebrows in the question. She hoped that he wouldn’t take the overdressing the wrong way. She didn’t want to make him nervous or anything. It wasn’t a date after all, it was a thank you for helping her with the mission. But what if he thought the wrong thing? So stupid to have overdressed. She mentally beat herself up on the way to the door, her eyes going flat. Not for long though, as they would enter, it would be like a passing storm on the sea. A faint, lopsided smile just barely pulled one corner of his mouth toward his cheek as Chiaki spoke, offering her gratitude for the mission they had completed together not long ago, as well as to treat him to barbecue. He wasn't much of one for accepting gifts, however as a native to the Fire Country, even the most minute celebration was too good to pass up. It was a rather common tradition in the Hidden Leaf to celebrate a completed mission with a meal, especially for new squads. He hadn't taken on a squad for longer than he could remember, so a feeling of melancholic nostalgia washed over him as memories of his first mission completed with his own squad as a genin resurfaced. Thinking better than to dwell on the recollection, he offered his response. "Don't sell yourself short, I was just a safety net. I've all the confidence that you could've handled it yourself just as well." He said, resisting the urge to pat her head in the manner that he had done prior to the mission as a gesture of reassurance, recalling that it hadn't had the desired effect the last time. "But, I appreciate it." He said, eyes trailing toward the dog and Chiaki's hand as the canine leaned forward, sniffing thoroughly before rubbing the top of his head against the palm of her hand. "Ahh, this is Kaoru by the way. He's well behaved, normally, so you'll hardly know he's there. Plus, this place is actually open to pets. Inuzuka tend to come here a lot, and they're usually a lot more rowdy than Kaoru is." At the notion of her being overdressed out of nervousness and subsequent embarrassment as a result, his gaze briefly glanced over her attire. It didn't seem so outlandish to him, but then again, he was hardly enough of a socialite to catch onto the more subtle nuances of appropriate attire for friends having lunch. "You look fine to me." He replied, thinking little more of it. Women's fashion was well beyond his scope of comprehension, he couldn't even begin to imagine what 'over dressed' constituted of, and a sun-dress certainly didn't fit under whatever he might have considered to be so. Mentally shrugging it off, he refocused on the main event; lunch. Gesturing for the restaurant, he opened and held the door for her, then Kaoru, before finally entering last himself. As they found themselves lead to their seats and seated, Takao's attention fell back onto Chiaki. "So, it's been a minute. How've you been?" Chiaki noticed the faint lopsided grin that permeated his face for a bit and she gave a bit of a sheepish smile back. Nodding to his mention of not to sell herself short, she caught a moment of hesitation in his free arm. Perhaps he was wanting to give her a handshake or something of the sort? Or reassure her in some other way. His eyes seemed to go to a thousand mile stare for a moment before snapping back to her and the present moment. Then they trailed to the dog, leading her to the self same mammalian companion. Kaoru, by his name, was sniffing her hand and she giggled, “Well, I just… I am used to doing things on my own so it’s nice.” She gave a soft smile, most of it to Takao’s kindness, but it was aimed at the dog, so she felt certain that he wouldn’t notice. Kaoru nuzzled her palm and she gave him a couple of scritches behind the ear, making sure to give him a positive response to the good behaviour. It was nice that he had brought Kaoru, a good third wheel if ever there was one, and cute besides. The comment that she looked fine to him brought a bit more color to her face as she tried not to overthink it. After all, he probably had someone like everyone else, and she didn’t want to get excited over nothing. They were greeted at the door by a gentleman that was dressed as a waiter and the sounds of bustle, sizzling meat, and general good-will. They were guided past a couple of stalls with people that were laughing and talking about missions, their day at work yesterday, and how the state of the hidden leaf was just ‘appalling to say the least.’ She grinned at this, remembering the over the top woman that they had talked with, Uyehara-san, and thought that even people like her would enjoy a place like this. "So, it's been a minute. How've you been?" Takao asked as they were seated, the dog doing his own thing in the meantime. She sat down and introspected for a moment, her eyes raising up and to the right, recollecting the past two weeks or so. “Well, I have completed another three missions.” She started slowly, “There was a group of bandits that attacked a village and I had help from a kunoichi that used lightning and was a real sweetheart to subdue them.” She started, wondering how much detail he was wanting, she could go into more detail, but didn’t want to bore him. “Oh and I completed a mission, and almost got charged with public indecency.” She grinned as the waiter came up to the table and asked for her orders. She deferred the option of lunch to Takao, wanting to have him order first. She wasn’t picky and, after all, she was treating him to brunch. This is the exit post: Using Takao's boost to training, as per him: "30% off all jutsu/40% off 2 jutsu/50% off 1 jutsu"
A slightly more noticeable smile pulled at his cheek as she mentioned being used to doing things on her own, something he empathized with, but didn't comment. He watched the pair-- Chiaki and Kaoru-- as the former gave the latter the attention he craved. With the topic's brief shift to the Inuzuka, he opted to comment on that instead, finding it to be a much more appropriate topic. "Not quite so big, at least I've never seen one that large, but they do grow large enough to ride. When I was a genin, my squad leader and one of my squad-mates were both Inuzuka." He said, offering his own nugget of experience with the canine clansmen to the conversation. In truth, he knew plenty about them, but that was not to say they were special, at least not in his eyes. He was well versed in all matters of the village, including clans, and knew their strengths and weaknesses well. Before they headed inside, he noted the blush on her face, but attributed that to the embarrassment she expressed over her choice of dress for the occasion, and let it slide without comment. As they were seated and Kaoru found a spot under the table to lay where he wasn't impeding anybody, taking up as little space as possible, his eyes fell to the menu. Chiaki began to speak and answered his inquiry about what she had been up to since their last meeting as he read, his attention flickering between the items on the menu and her as she spoke. "Somebody's been busy," He said with a faint smirk, remarking that the kunoichi Chiaki spoke of reminded him of Fuyuko, who used lightning and was rather adverse to killing, preferring to subdue or knock out if possible. He nodded along as she continued, speaking of her place in the hospital. "Already found a spot in the hospital, huh. Knew you could do it," He said, lifting his head a bit to flash her a warm smile before he returned his gaze to the menu, his attention grabbed her her sigh, and then admission to nearly making a fatal mistake at the hospital. His gaze lifted, not his head, as he glanced her over, considering a response. "Everybody makes mistakes. Just be sure to learn from it and you'll be fine." Perhaps the advice, coveted and mind-blowing as it was, was not wholly needed or wanted, but it felt appropriate to say something of comfort rather than coldly glossing over it. He had made his fair share of mistakes in the past, some of them fatal indeed for others, and was never paid the same courtesy. The mood immediately lightened over the table at her last admission about nearly being charged with public indecency, which his mouth had parted to respond to, only to be interrupted by the approaching waiter. "Uh-..." He muttered, gaze falling to the menu. "Hey, check this out," Takao said, pointing to a 'lunch sakura course for two' portion of the menu, partially shown to Chiaki. The list contained a myriad of food; Gyu-kaku salad, miso soup, white rice, fried chicken, as well as barbecue items like bone-in Kalbi short rib, yaki-shabu beef miso, toro beef tare with sweet soy, chicken breast with basil and teriyaki, and beef-horumon with spicy gochujang, as well as ice cream in the shape of sakura petals. "It's a lunch for two. How 'bout we split it fifty-fifty?" He suggested. For the amount of food received, four starters, five barbecue items, plus dessert and sake, it seemed like a good deal. It was a fair amount of food as well, perhaps they might not be able to eat it all between just the two, yet he had worked up quite an appetite with all the work he'd done in the morning.